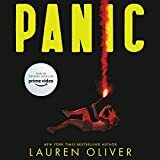 Panic is a novel for young adults set in a small run-down town in the Hudson Valley of New York. It's a dystopia, where the high school seniors have no hope, and engage in a game called Panic to win $67,000. They are so desperate they risk their lives and the lives of others. Some characters dream they could leave town, as if they were in the middle of Montana, and they couldn't just get on the Metro North and go down to New York City. So although the story lacks any science fiction or supernatural elements, it still requires entering into a fictional world, quite close to the real one, where there are no opportunities and everything goes wrong. One family has tigers, which requires an extra suspension of disbelief on the part of the reader. The teens here lead lives of misery. They are confused, angry, and full of feelings. Dodge is out to avenge his sister, who was paralyzed in a car crash in a previous year of Panic. Heather has a terrible mother who can't cope with her own life, so Heather has to look after her little sister. Heather's best friend Nat is an emotional mess with manipulative tendencies. They and their friends are all playing the secret game. The novel is fast moving and has plenty of drama. The Panic game proceeds with challenges involving mortal danger and terrible fear. There are also romances and broken relationships. The characters are looking for love, and they think they have found it, but it does not work out. They want to get into lifetime relationships and they are destroyed when they run into troubles. This picture of teens seems to come more from a 1950s James Dean movie rather than based on the growing trend of no-commitment hook-up culture that we mostly hear about modern adolescents. At times the level of neurosis and torture brings to mind Tennessee Williams. The kids in Panic are old before their time, acting like people in their late middle age, looking for a last chance at leading a good life. They take their lives so seriously you just want to shout at them to lighten up. If there was a soundtrack to the novel, they should all be listing to some kind of Death metal or Goth gloom. Of course, teens do sometimes think this way. But readers (or listeners to the audiobook) may not want to devote 8 hours of their lives to immersing themselves in this world of hurt. There are moments here where Oliver gets into the heads of her characters so powerfully that there seems to be some important idea waiting to emerge. Oliver is good at the intimate dialogs between people in dysfunctional relationships. But the plot is ridiculous. Fans of Oliver may give her the benefit of the doubt, since she has written some strong work in the past, but that past is looking more distant. Sarah Drew's performance of the audiobook is good in that she delivers urgency and fragility, and she has a good range of voices for different characters. She is a bit harsh on the character Nat, who is unrelentingly annoying in this reading.